Following on from the last post, and staying true to my word, this post is all about Rozzy! The lovely, caring, fun receptionist at CBC who recently started helping me once a week in the kitchen. Together we tackle “fabulous fridays” and we always have a laugh together and a good natter! 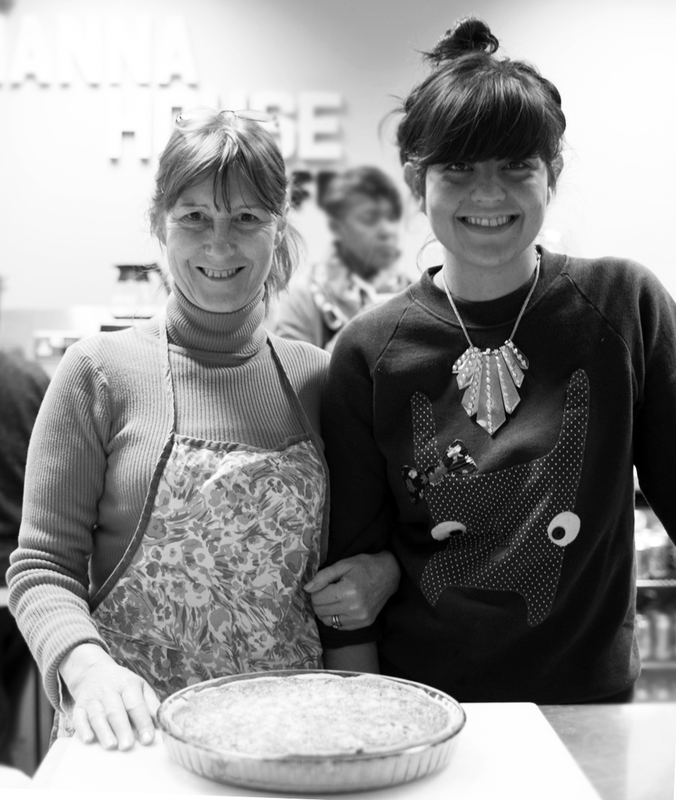 It is so wonderful to be able to glean from Rozzy’s many years of experience in the kitchen, and I have definitely improved on my efficiency since working with her- she is full of beans! 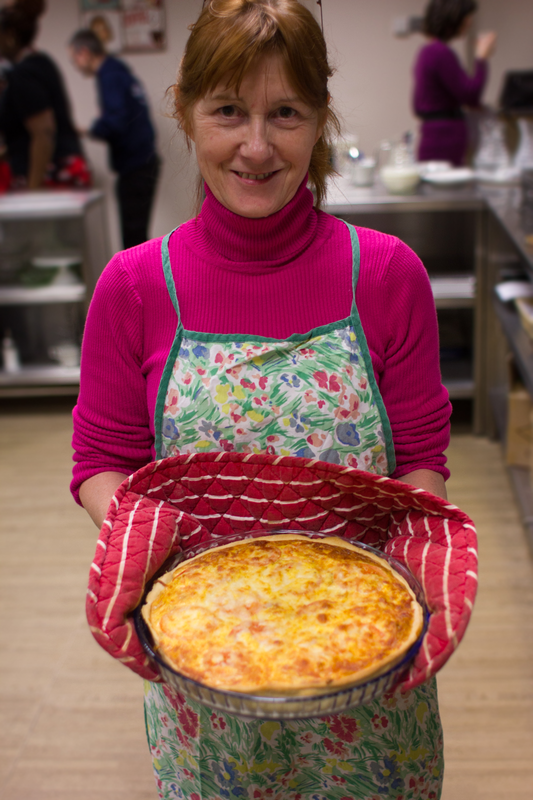 In this post I am going to share with you Rozzy’s recipe for her amazing quiche… I know what you may be thinking right now.. quiche is quiche, it’s an everyday, family-gathering or church bring-and-share, eggy pie…nothing special…right? Wrong! 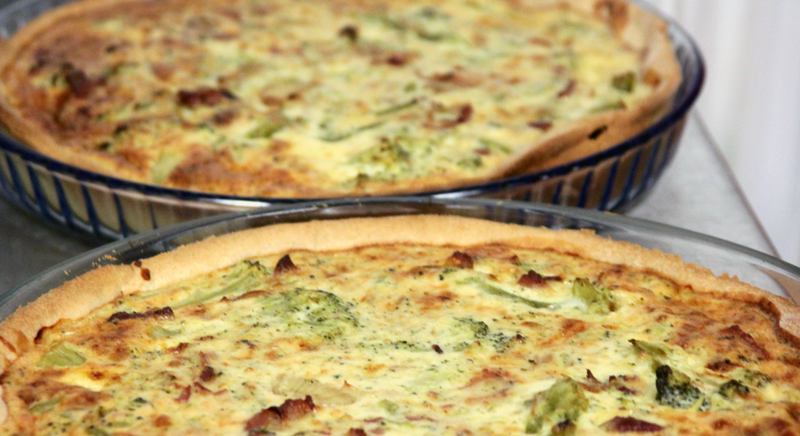 I was never a fan of the old quiche until now..
this recipe is totally delicious, creamy and tasty and not at all eggy! I have honestly never tasted quiche like it and I am now hugely in love with this dish! Try and and let me know what you think! ½ lb pastry 8 oz flour/ ½ fat = (mixture of ½ marge or unsalted butter, with ½ Lard). Blind baked pie crust (either store bought or homemade) pastry needs to be quite crusty but not brown. Prepare your quiche dish with a little fat flour and put in your rolled out pastry and blind bake this for about ½ hour on gas mark 4/350 degrees. Let it cool before filling. Preheat your oven to Gas mark 4/350 degrees F.
Cook the bacon in a skillet set over medium heat for about 10 minutes until crisp, then chop the bacon into small pieces and reserve for later. Cook diced onion in what’s left of bacon fat. Add the chopped broccoli florets to the pan and season with a pinch of salt and pepper. Cook the broccoli for 5-10 minutes until it’s tender and green but not mushy. 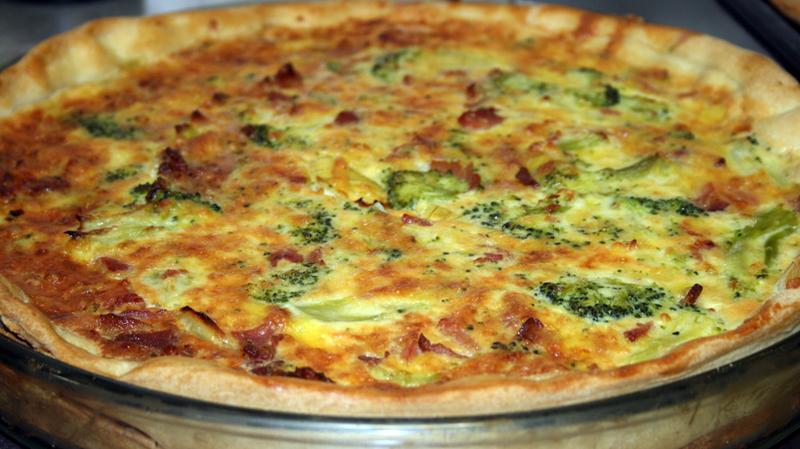 Evenly spread the cooked broccoli and bacon and onion in your blind baked tart crust, and top it evenly with the grated cheddar cheese. Make the custard mixture by whisking together the milk, sauce with eggs, salt, black pepper, and the nutmeg. Pour the custard into the tart shell, and bake the tart for 30 – 40 minutes. Do not let the edges of the pastry burn while cooking the centre of the quiche if needs be turn oven down. You know the tart is ready when you can no longer see liquid but the centre of the tart press middle is spongy. Cut the tart into pieces and serve! Oh, and by the way, this tart reheats really well. Pop it into the oven or microwave until warm. Thank you Rozzy for this recipe, and thank you for all your help! 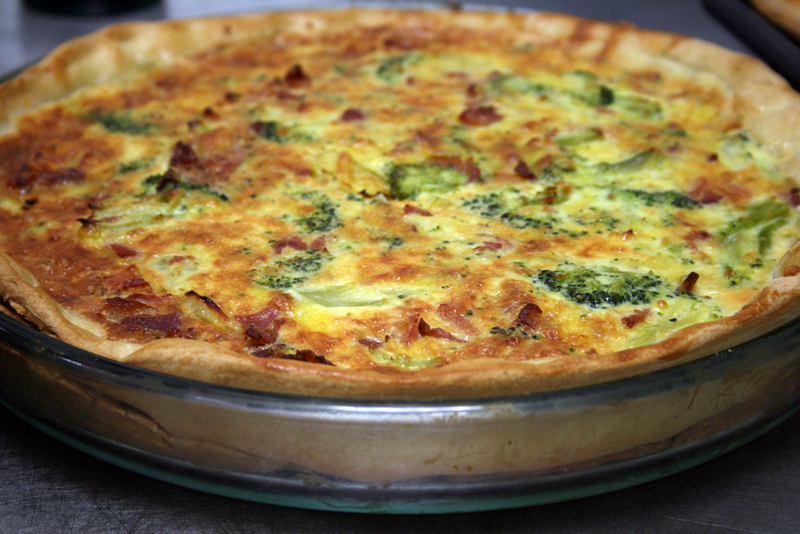 This entry was posted in baking and tagged homemade quiche, quiche, quiche recipe. Bookmark the permalink. Yummy! I love this quiche. Really delicious! thanks wifey!